Welcome to Elite Precious Metals, Inc.
for your precious metal scrap! 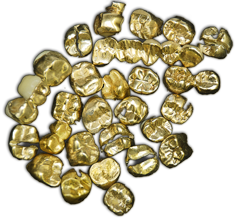 Industry wide, a large number of dentists & dental practices are accustomed to receiving cash, on the spot, for their scrap based on weight. This is simply not the most beneficial way to approach scrap refining. The main reason is an obvious one, there is no way to determine what the precise metal content is by weight alone. There are hundreds of different alloys, some very rich in gold and palladium, some are totally non-precious. The only way to determine this is to smelt the scrap, sample and assay it (see refining process). This is the method Elite Precious Metals always recommends because it results in significantly higher returns. In addition, this process takes no more than one week and if you're in the greater Chicago area (roughly a couple hours in any direction) we can still settle with you in cash. Realize this, all dental scrap ultimately gets refined so why not go that route from the begining and keep the surplus value. ©2014 Elite Precious Metals, Inc. All Rights Reserved.